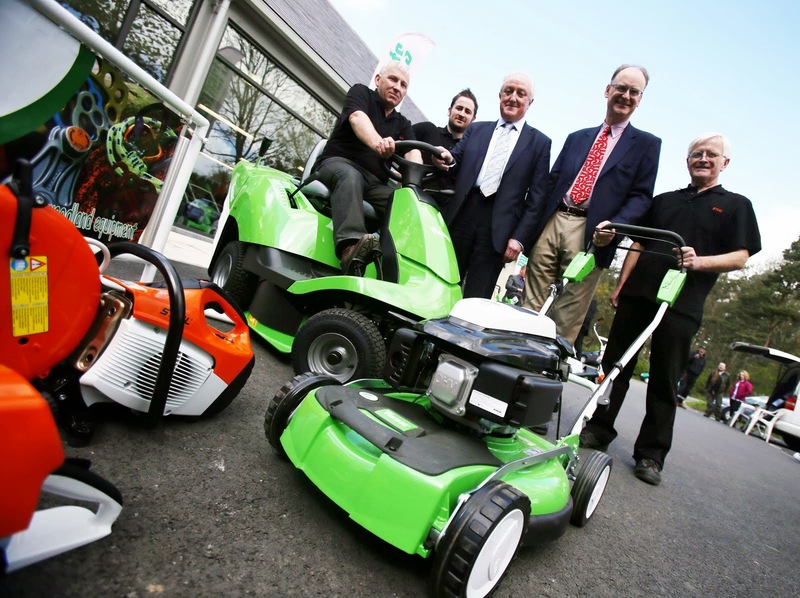 NORTHUMBERLAND family business Gustharts has invested in a brand new 3500 sq ft flagship showroom, which will also offer an additional 3000 sq ft of storage space, on Blagdon Estate to handle the growing demand for its garden power tools and range of equipment for professional users. Established in 1985, Gustharts sells equipment to gardeners as well as those working in the woodland, landscape and arborist (tree surgeon) trades. A major Dealer in the STIHL and VIKING product ranges, Gustharts sells everything from chainsaws to hedge-trimmers, multi-tools and lawn mowers to protective clothing. 2012 was the best year to date for the family firm run by Rob Gusthart and his brother-in-law Michael and nephew Phillip Mitchell. The company grew turnover by 15 percent to bypass the £1m mark in the last 12 months, and despite the poor UK weather, April 2013 was their best ever month in the history of the business. In 2001 they introduced climbing kit for arborists when one customer asked for a single harness and now Gustharts is the biggest specialist tree-climbing equipment supplier in the North, also supplying many colleges across the UK. Their specialist tree-climbing equipment also gets sent to EEC countries, with some internet sales travelling as far as New Zealand and Australia. A need for more space for storage and good quality display space for demonstrations led Gustharts to double its space at Blagdon Estate with a brand new showroom and workshop built by the estate owner, Lord Ridley, with Gustharts subsequently investing £120,000 in a state-of-the-art shop fit and green IT equipment. The new showroom is located adjacent to Gustharts’ former site on Blagdon Estate, but the new enhanced two-storey 6500 sq ft layout has almost doubled their space. Rob Gusthart said: “Now we have the bigger showroom customer equipment demos are much easier and people are browsing or just popping in to look round, as opposed to before in our smaller workshop when we didn't have much passing trade. The investment in green IT facilities was handled by EastQuayIT who installed a special ‘veryPC’ server that is designed to consume less power and a number of ‘veryPCs’ at the new premises. Built using a unique chassis which comprises 100 percent aluminum sourced from renewable and geothermal resources, the PCs are engineered for Low Power Consumption with Eco Power Management and consume around 80 percent less power than a typical PC. The company was established on 4th November 1985 as Gustharts Chainsaw Centre and coincidentally moved into its brand new showroom on the same day (4th November) last year. Marking the official opening recently was Lord Ridley and managing director of STIHL GB, Robin Lennie. Gustharts is one of the first STIHL Dealerships in Britain to benefit from both its smart showroom fit-out and a bespoke workshop facility, making it a flagship Dealer for the German firm. Gustharts took on its first employee 15 years ago, and now has nine staff which it hopes to grow considerably in the next few years. For further information on Gustharts visit www.gustharts.com.